well, we finally managed to steel ourselves and cross the M62 into the wilds of wakefield to visit the yorkshire sculpture park for the first time this year, in order to see andy goldsworthy's exhibition which marks the park's 30th anniversary. 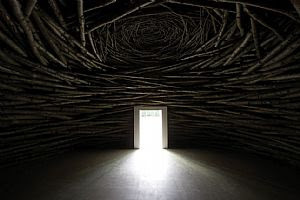 now, mr goldsworthy has often seemed to be a little too 'coffee table' for my tastes, but that says more about me and my crass assumptions than it does the actual work, which was both thoughtful and thought provoking. as well as smelly. having left city living behind about 4 years ago, the role of man in the creation of the rural space and the often fleeting beauty to be found as weather conditions change, becomes apparent on a day-to-day basis. goldsworthy understands this deeply. i won't get all art crit. on you- there's plenty of stuff on the net if you wish to investigate further (and no doubt his work is already well known to you), but i can't recommend this show enough- particularly as there is a nice retrospective in the smaller galleries, which highlights what a nutter he is. a good long walk also included.